Former Col. 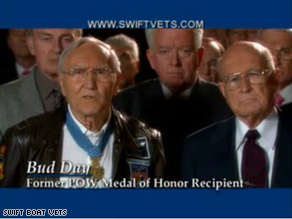 Bud Day appeared in a 2004 Swift Boat Vets spot. (CNN) - One of the members of John McCain’s new Truth Squad - which his campaign says was launched to respond to unfair attacks on his record of military service –- was a member of the Swift Boat Veterans for Truth, and appeared in an attack ad for the group in 2004. The group was created to attack 2004 Democratic nominee John Kerry’s military service record. McCain has said that he opposed the group’s efforts. On a campaign conference call Monday, a Politico reporter asked Day if there was any similarity between former Gen. Wesley Clark’s controversial Sunday comments about McCain’s military service and his own remarks about John Kerry during the last presidential campaign. Day dismissed any equivalence. "The Swift Boat 'attacks' were simply revelation of the truth. The similarity does not exist here," he said. "…One was about laying out the truth. This one is about attempting to cast a new shadow on John McCain." The comments Clark made were very poorly phrased. He shouldn't have said a word about McCain being a POW. The underlying point was valid. There's a big difference between giving orders and executing orders. McCain only executed orders he received during his vietnam service. Undoubtedly he did tactical planning for the missions he flew. That sort of experience is VERY different from the strategic thinking a President must do. And even then, it largely comes down to asking the right questions of the Pentagon. Lets face it, the President isn't sitting in the Oval Office , drawing up battle plans. The President determines whats to be done, the DoD develops the plans on HOW to do it, then teh president approves or disapproves of those plans. Wow, isn't that amazing what's good for the goose isn't good for the gander. I truly believe that any former US soldier that put down the other is a disgrace to our country and military forces. So, Day neither Clark should be making the type of statements that have been made. We have soldiers dying and this is the type of expressions coming from to former war heros. Well they don't sound much like heros to me. They both should be ashame. Well, last thing that I expect from future first lady to show some positive side of her life. to keep the president motivated Living a normal life is considered as not interesting, its a news for me. I am not sure what kind of message, she is trying to give. If I will listen from her again, may be I will go to the depression state. I really need to know why Barack loves her, just curious !!. All I wish for a real change as we see some of the major issues ahead. Most of us know what could be the right solution. I wish the next president , I believe that will be Sen. Obama as everyone hates republican leadership should keep his ear's open to suggestion and take some action. Doing something and failing is still acceptable than sitting and watching. Yada, yada–we've heard it before. We will not be swayed. The attack on McCain's service today hurt me deeply. I just dont see why Obama would send his surrogates out on this type of street fight mission. I honor my father and all the American fathers and grandfathers who made it possible by coalition of American to give me and my children the freedoms that we have today. My father was a great man, father and grandfather. He used to joke that he was a vetran of two wives and two wars, slightly disabled by both. He also worked best when his back was against the wall, he went on after his service and became a CEO, a poet and an Inventor. There are currently six manufacturing patents in the Aerospace Industry that his family holds and continues for him in his honor. His latest unlaunced invention before his demise was an Oil Spill Recovery System, I Plan to launch it for him. I will be voting for McCain! If the Swift Boat Veterans for Slander...(oops)...Truth hold military service in high regard, why in 2004 did they discredit a decorated veteran who served in combat and help elect a privileged drunk who pulled every string possible to avoid Vietnam? Kerry was awarded a Slver Star, Bronze Star and two Purple Hearts. Bush did some flight training in Texas and got his teeth cleaned in Alabama. One more thing, just how big is a swift boat? There were so many of these guys who said they served on the same boat as Kerry, these things would have to be the size of a battleship. Want to see how honest McCain is? Check the Keating 5 proceedings and you will learn all you need to know about McCain. If you or I had been involved, we would still be looking through jail bars. Enough said!! Gee, I never would have thought that John McCain would do one thing (saying his service should be critique free), while doing another (attacking Kerry's service)...not John McFlipFlop! McCain is the only TRUE war hroe we have seen in a long time. GOD bLESS HIM AND THE MEN WHHO ARE LIKE HIM. what ar the two old guys names in the Muppets???? The McCain campaign just can't anything right. America is DONE with politics as usual, featuring partisan hacks who specialize in "gotcha" politics. He is still not admitting that Swift Boat was a whopper of a lie, shame on Day and double shame on McCain for jumping in bed with yet another person of dubious morality.